Genome-wide assays performed in Arabidopsis and other organisms have revealed that the translation status of mRNAs responds dramatically to different environmental stresses and genetic lesions in the translation apparatus. To identify additional features of the global landscape of translational control, we used microarray analysis of polysomal as well as non-polysomal mRNAs to examine the defects in translation in a poly(A) binding protein mutant, pab2 pab8, as well as in a mutant of a large ribosomal subunit protein, rpl24b/shortvalve1. The mutation of RPL24B stimulated the ribosome occupancy of mRNAs for nuclear encoded ribosomal proteins. Detailed analysis yielded new insights into the translational regulon containing the ribosomal protein mRNAs. First, the ribosome occupancy defects in the rpl24b mutant partially overlapped with those in a previously analyzed initiation factor mutant, eif3h. Second, a group of mRNAs with incomplete coding sequences appeared to be uncoupled from the regulon, since their dependence on RPL24B differed from regular mRNAs. Third, different sister paralogs of the ribosomal proteins differed in their translation state in the wild-type. Some sister paralogs also differed in their response to the rpl24b mutation. In contrast to rpl24b, the pab2 pab8 mutant revealed few gene specific translational defects, but a group of seed storage protein mRNAs were stimulated in their ribosome occupancy. In the course of this work, while optimizing the statistical analysis of ribosome occupancy data, we collected 12 biological replicates of translation states from wild-type seedlings. We defined 20% of mRNAs as having a high variance in their translation state. Many of these mRNAs were functionally associated with responses to the environment, suggesting that subtle variation in the environmental conditions is sensed by plants and transduced to affect the translational efficiency of hundreds of mRNAs. These data represent the first genome-wide analysis of translation in a eukaryote defective in the large ribosomal subunit. RPL24 and eIF3h play similar but non-identical roles in eukaryotic translation. The data also shed light on the fine structure of the regulon of ribosomal protein mRNAs. The ribosome is responsible for the translation of all mRNAs into protein. Specific ribosomal protein mutations underlie certain human diseases (ribosomopathies). Different ribosomal protein mutations also cause different spectra of developmental defects in metazoans and plants [1–3]. These observations have raised interest in the contributions of the individual ribosomal proteins to translation of different mRNAs. However, few studies have examined the consequences of ribosome defects on translation, and in the vast majority of case studies no genome-wide data are available. One exception concerns the ribosomal protein of the small subunit, RPS19. A mutation in Rps19 is responsible for cases of human Diamond-Blackfan anemia. The rps19 mutation causes both inhibition and stimulation of several dozen mRNAs, including several that are implicated in the etiology of the disease . In another example, a mutation in mouse Rpl38 results in a homeotic transformation affecting the ribcage. The rpl38 mutation interferes with translation of homeobox mRNAs . Genome-wide studies of translation under different stresses and environmental conditions have provided a wealth of information on global translation control in the model plant Arabidopsis thaliana[6–17]. However, even in Arabidopsis, which has become one of the premier model organisms for translatome research, information on the role of specific translation factors is limited. The different isoforms of eukaryotic initiation factors eIF4E and eIF4G, which are components of the mRNA cap-binding complex, contribute differentially to translation [18, 19]. The eIF3 complex is the largest of the initiation factors. Some evidence points toward a role for eIF3 in promoting the translation of specific 'client’ mRNAs [20–23]. Only one global plant translation profile has been obtained from a mutant with a defect in the translation apparatus . In detail, mutations that delete the C-terminus of eIF3h compromise translation reinitiation on mRNAs containing upstream open reading frames (uORFs), and also increase the polysome loading of mRNAs with long 5′ leader or coding sequences [20, 21, 24, 25]. Ribosomal protein RPL24 (eukaryote-specific Rpl24e) is a constituent of the cytosolic large 60S subunit. A mutant of A. thaliana in which one of three RPL24-encoding genes, RPL24B, is deleted (shortvalve1, stv1), is characterized by developmental pattern defects in the base of the fruit . Normal fruit patterning is regulated by uORFs and requires RPL24-dependent translation reinitiation on certain uORF-containing mRNAs [25, 26]. The major RPL24B paralog, RPL24A, has also been implicated in the translation reinitiation on mRNAs with multiple coding regions . In single-gene reporter gene expression assays of the uORF-containing mRNA, AtbZIP11, the molecular defects in rpl24b resemble those in the eif3h mutant. The seedling phenotypes of eif3h and rpl24b, while not identical, overlap with respect to vascular development, gynoecium structures, and other organs . These data suggest that RPL24B and eIF3h have related functions, although their exact biochemical roles are unclear. In Arabidopsis, all ribosomal proteins are encoded by at least two paralogs, which are typically at least partially redundant [1, 27]. RPL24A (At2g36620) and RPL24B (At3g53020) are expressed at similarly high levels. The third and final paralog, RPL24C (At2g44860), is expressed at a fourfold lower level, and the protein may be enriched in the nucleolus . RPL24 has also been investigated in mouse and yeast. A mutation in the single mouse Rpl24 gene, Belly spot and tail (Bst), is homozygous lethal while heterozygotes show a pleiotropic developmental phenotype . For comparison, a double mutant in the two RPL24 genes of the yeast Saccharomyces cerevisiae is not lethal [30, 31]. These results suggest that the yeast ribosome can assemble successfully without RPL24, in keeping with RPL24 being one of the last proteins to be assembled into the 60S subunit . Another specific protein that has been implicated in plant translational control is poly(A)-binding protein (PABP) [33–36]. By bridging between the 5′ cap binding complex and the 3′ poly(A) tail, PABP is thought to enhance ribosome recycling and thus translation [37–39]. In Arabidopsis the class II PABP genes (PAB2, PAB4 and PAB8) are the more highly expressed in seedlings and encode the bulk of PABP in seedlings . There are no reports of mRNA-specific translational defects for any pab mutant. For this study, we sought to identify the translational defects in two new types of mutants that affect the translation apparatus. We report here one of the first global analyses of ribosome occupancy in any organism for a ribosomal protein mutant, Arabidopsis rpl24b. This mutant was chosen because of its functional association with the initiation factor eIF3h, for which a mutant translatome is already available . We also report ribosome occupancy data in the Arabidopsis pab2 pab8 double mutant. This mutant is viable, yet slightly dwarfed, indicative of compromised PABP activity; a pab2 pab4 pab8 triple mutant has not been recovered . The translational defects in the pab mutant were comparatively subtle and restricted to residual mRNAs that are expressed highly in late embryogenesis. In contrast, the rpl24b mutation altered the ribosome occupancy of hundreds of mRNAs. In keeping with the related developmental phenotypes of the rpl24b and eif3h mutations, their translational defects also overlapped. Ribosomal protein (r-protein) mRNAs were the most highly affected functional category. The ribosome occupancy of nuclear encoded r-proteins was typically stimulated by the rpl24b mutation. A large fraction of r-proteins, but not all, appear to belong to a single regulon of translational control. Seedlings of previously described mutant alleles were grown for the pab2 pab8 double mutant , the eif3h-1 mutant , and rpl24b (shortvalve1-1)  (see Methods). Polysome microarray data from the rpl24b mutant and the pab2 pab8 mutant were collected using sucrose gradient fractionation of ribonucleoprotein complexes from Arabidopsis seedlings and were processed as described in Methods. In parallel, equivalent data from a published experiment  on the eif3h mutant were reanalyzed from the hybridization signals using the same procedure as for rpl24b. The translation state (TL) is defined as the ratio between the mRNA signal in the polysomal: non-polysomal fractions and is displayed as a log2 value. For example, an mRNA that is 80% polysomal and 20% non-polysomal receives a TL of 4.0 and a log2 TL of +2.0. For this reason the TL value is completely independent of the transcript level (TC). We carefully evaluated many different data processing procedures in order to optimize detection of differentially translated genes (DTGs; see Methods). DTGs between mutant and wild-type were first mined using a stringent false-discovery-rate (FDR) cut-off of 5%. From the entire set of 22,746 probe sets, we identified 138 and 143 DTGs for rpl24b and eif3h, respectively. Because this number for eif3h was small compared to the number of DTGs identified in the earlier publication , we sought to expand the gene set. Using the 3 additional prefiltering methods laid out in the Methods, we assembled a non-redundant set of DTGs, 155 for rpl24b and 388 for eif3h (Figure 1A-C). Differentially translated genes in rpl24b and eif3h mutant Arabidopsis seedlings. (A) A total of 155 and 388 non-redundant genes with differential translation state (TL) (|Δlog2 translation state| ≥1.0, false discovery rate (FDR) <0.05) were identified in rpl24b and eif3h seedlings, respectively. The Roman numerals represent the four gene sets used in identifying differentially translated genes (DTGs), and three of the sets were first filtered by one or more methods. I = all Arabidopsis genes (n = 22,746) represented on GeneChip® ATH1 Genome Array; II = all genes with raw signal values detected above background or no 'A’ calls in at least 50% of arrays (n = 8 to 12); III = all genes with stable translation state (TL) in 12 wild-type 'replicate’ samples (n = 18,029 genes); IV = genes from set III that had a 'P/M’ call for each of 24 replicate arrays from wild-type seedlings. The number of DTGs from each of the gene sets is shown at the bottom, and the number in the non-redundant set is underlined on the right (total). (B,C) Venn diagrams showing the overlap in the number of DTGs from the four gene sets in (A) for rpl24b (B) and eif3h (C) datasets. The rate of false positives (FDR) in the total non-redundant set will be slightly higher than 0.05, due to the increase in the number of comparisons. Because translation of AtbZIP11, AUXIN RESPONSE FACTOR3 (ETTIN) and ARF5 (MONOPTEROS) depend on functional eIF3h and RPL24B [25, 26], one might hypothesize that eIF3h and RPL24B control the ribosome loading of identical sets of client mRNAs. We tested this hypothesis by comparing clusters of genes that are altered at the translation level in eif3h and rpl24b mutants. Among the DTGs in rpl24b or eif3h, the direction and the degree of mistranslation were significantly correlated (R2 = 0.51). This indicates that translation of many mRNAs are coregulated by, or codependent on, RPL24B and eIF3h (Figure 2A,B). Remarkably, among all the mRNAs that were overtranslated in eif3h (Δlog2 TL >1, FDR <0.05), the vast majority had a trend towards overtranslation in the rpl24b dataset (Δlog2 TL >0; P <0.0001, ranked sign test); the same held true for undertranslated mRNAs (P <0.0001). This result indicates that a substantial and significant number of Arabidopsis mRNAs are codependent on eIF3h and RPL24B for appropriate translation. The mRNAs that were translationally stimulated in both rpl24b and eif3h mutants were enriched in ribosomal protein mRNAs (Additional file 1, also below) while the undertranslated ones had no detectable functional bias. Translation states (TL) in the rpl24b mutant resemble those in eif3h . (A) Scatterplot comparing translational alterations in the rpl24b mutant with those in the eif3h mutant. Only differentially translated genes (DTGs), that is, genes with differential translation state (|log2 ΔTL| ≥1.0, false discovery rate (FDR) <0.05; n = 478) are shown. Blue, differentially undertranslated in both mutants; red, differentially overtranslated in both mutants; black, differentially translated in either mutant. R2, Pearson correlation coefficients. Dashed lines represent twofold changes. (B) Venn diagrams showing the translational coregulation of sets of mRNAs by RPL24B and/or eIF3h. Overlap for genes undertranslated (top) or overtranslated (bottom) in the eif3h and/or rpl24b mutant. (C) Scatterplot comparing translational alterations in the rpl24b mutant with pab2 pab8 mutant. All genes on the ATH1 array are shown. (D) Scatterplot comparing total mRNA transcript levels (TC) between rpl24b and eif3h. (E) Heatmaps of fuzzy k-means clustering of 478 differentially translated genes identified from Robust Multi-array Average-normalized combined data of rpl24b (3 biological replicates) and eif3h mutants (2 replicates). 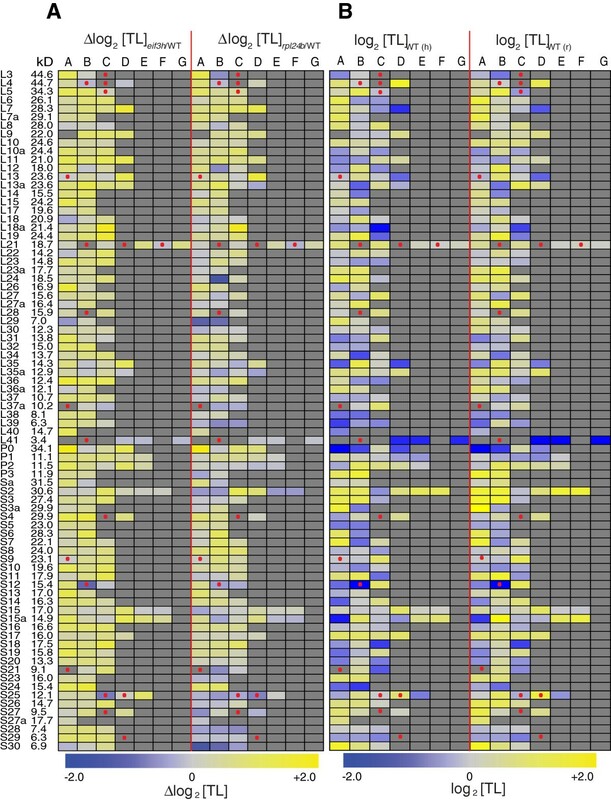 The heatmaps show median Δlog2 TL expression values for each of six clusters of mRNAs that show similar translation defects in each mutant over wild-type. A TL = 2.0 corresponds to 80% of the mRNA in the polysomal fraction, and TL = -2.0 corresponds to 20% in the polysomal fraction. The number of genes in each cluster is indicated. The heatmap color panel indicates undertranslation (blue), overtranslation (yellow) and no change (white) in mRNA translation. (F) List of the most significantly enriched Gene Ontology (GO) categories for each cluster. GO terms, BP: biological process; CC: cellular component; MF: molecular function. Adjusted P values and the fold enrichment of the given GO category compared to the reference set are listed. The effects of rpl24b and eif3h on transcript abundance were also correlated (R2 = 0.374) (see Figure 2D; Additional file 1). Because RPL24 and eIF3h are translation factors, we presume that most of the changes at the transcript level are a consequence, rather than a cause, of alterations in translation. We also note that the translational defects in the rpl24b mutant are not strongly correlated with changes in total transcript levels, similar as for eif3h (Additional file 2: Figure S1). To work out whether there are mRNAs that depend on only 1 of the 2 genes, RPL24B or eIF3h, but not on the other, we performed fuzzy k-means clustering on a total of 478 DTGs (Figure 2E). Two of six clusters, clusters 1 and 6, corresponded to the strongly coregulated mRNAs. Two other clusters, clusters 2 and 5, showed more limited coregulation, that is, a strong response in one mutant and a moderate trend in the other. The last two clusters, clusters 3 and 4, contained mRNAs whose response was much stronger in eif3h than in rpl24b. There were few RPL24B-specific mRNAs. Overall, these results underscore the significant overlap between sets of mRNAs mistranslated in eif3h and rpl24b mutants. These new findings bolster the conclusion that RPL24B and eIF3h play related roles in eukaryotic gene expression. The poly(A) binding proteins are widely thought to stimulate translation in a cellular context by helping to juxtapose 3′ end and 5′ end of mRNAs and by assisting with ribosome recycling. PAB2, PAB4, and PAB8 are the three major PABP genes expressed in seedlings and are functionally redundant. The pab2 pab8 double mutant is mildly dwarfed [33, 34]. We examined the ribosome occupancy of mRNAs in the pab2 pab8 double mutant seedlings (Figure 3). Overall, the pab2 pab8 double mutant had few gene-specific alterations in its ribosome occupancy. The primary FDR-controlled alteration was an approximately twofold increase in ribosome occupancy for a small group of seed storage protein mRNAs (Figure 3A). This result is of interest, as seed storage protein mRNAs are under translational control in various other plants . Less stringent filtering using an alternative ad hoc method to identify DTGs (see Methods) recovered oleosins, which are additional seed storage mRNAs, and Late Embryogenesis Abundant mRNAs among the mRNAs with increased ribosome loading in pab2 pab8. It is notable that PAB4, the major remaining PABP mRNA in the pab2 pab8 mutant, was also translationally stimulated. 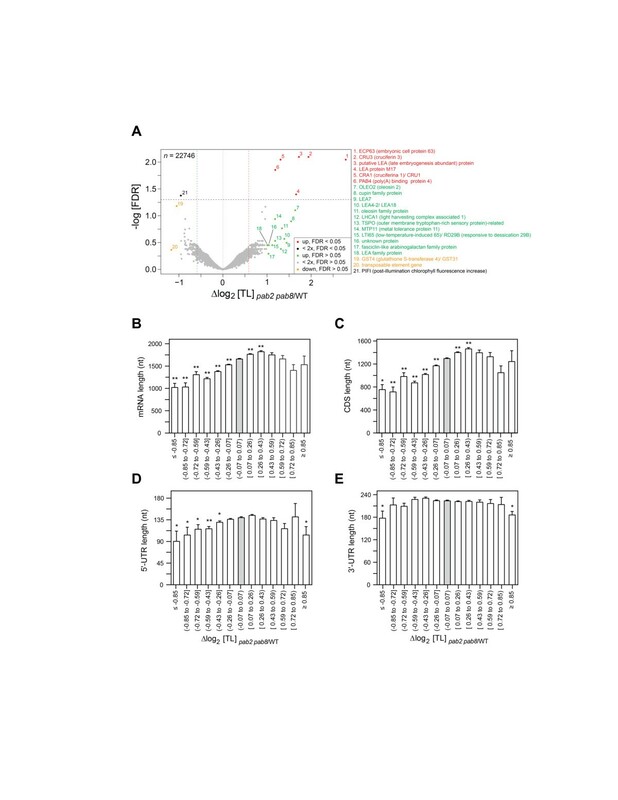 This result favors the hypothesis that PABP mRNAs are subject to negative translational autoregulation via poly(A) stretches in their 5′ untranslated regions (UTRs) . Translation states (TL) in the pab2 pab8 poly(A) binding protein mutant. Δlog2 TL indicates translational stimulation (>0) or inhibition (<0) in the pab2 pab8 mutant as compared to wild-type. (A) Volcano plot showing the distribution of alterations in ribosome occupancy (x-axis) versus the false discovery rate (FDR, y-axis). Many of the translationally stimulated mRNAs encode seed storage proteins. The color coding distinguishes mRNAs with FDR-validated significance (red for upregulated, black for downregulated) from mRNAs showing trends only (green for upregulated, orange for downregulated). Genes above the stippled line are less than 5% likely to be false positives. (B-E) The effect of the pab mutation on ribosome occupancy is related to mRNA length (B), specifically the lengths of the coding sequence (C) and 5′ untranslated region (UTR) (D), rather than the 3′ UTR (E). Asterisks indicate a significant difference compared to the gray 'no change’ bin (Student t test); **P <0.0001; * ≥ 0.0001 P <0.05. Error bars are standard errors of the mean. We compared the translational alterations in the rpl24b mutant with those in pab2 pab8. Not even a weak correlation was detected (Figure 2C). This important result suggests that different perturbations of the translational machinery affect different sets of mRNAs. Because most alterations in ribosome occupancy in pab2 pab8 were small and statistically insignificant on a single-gene basis, we searched for global patterns. Short mRNAs were enriched among the mRNAs that were translationally inhibited in the pab2 pab8 mutant (Figure 3B). This trend could be attributed to the length of the coding sequence as well as the length of the 5′ UTR, while the length of the 3′ UTR contributed little if at all (Figure 3C-E). Analysis of mRNA transcript levels in the pab2 pab8 mutant revealed 24 and 107 significantly downregulated and upregulated genes at the mRNA transcript level. The transcript levels of PAB2 and PAB8 were reduced, as expected given the T-DNA insertions in these genes in the pab2 pab8 strain. Interestingly, among the 14 mRNAs with >2-fold increased ribosome occupancy in pab2 pab8 all except 1 (PAB4) are late-embryogenesis mRNAs whose level declines up to 1000-fold during seed germination, the developmental period preceding our analysis. Of them, 12 were also upregulated at the transcript level in pab2 pab8. For pab2 pab8, and in contrast to the situation in rpl24b, the correlation between translational and transcript-level stimulation continued among the less strongly stimulated mRNAs (Additional file 1). This result suggests that wild-type PABP might couple transcript turnover and translation state for these late embryogenesis mRNAs. We performed genome ontology (GO) analyses of the six clusters of RPL24B or eIF3h dependent mRNAs identified by fuzzy k-means clustering (Figure 2E,F). Clusters 6 and 5 were both highly enriched for r-protein mRNAs. Of note, cytosolic r-protein mRNAs are coordinately affected in response to sucrose starvation , drought , hypoxia stress [6, 7], and unanticipated darkness . However, in each of these stresses, the r-protein mRNAs are undertranslated rather than overtranslated. To detect smaller effects of RPL24B and eIF3h on the ribosomal protein mRNAs, we adopted the ad hoc filtering method to identify differentially translated genes (DTGadhoc) . The ad hoc method does not control for FDR (see Methods). This method enriched even more significantly for r-proteins (P = 4.8E-03 to 2.1E-68; Additional file 3: Figure S2). Of all the cytosolic r-protein mRNAs for which the arrays yielded data (n = 137), 41% were found in clusters 4 to 7, a 5.8-fold enrichment. This result suggests that the ad hoc method, which is less conservative than the FDR method, produces fewer false negative calls. These results, therefore, confirm in more detail that many but not all cytosolic r-protein mRNAs depend on RPL24B and eIF3h at the translation level and could define a regulon of translational control . mRNAs that were affected by eif3h or rpl24b mutations were not generally perturbed by the pab2 pab8 mutations or by a mutation in the k subunit of eIF3 (eif3k) (Additional file 3: Figure S2C). We next visualized the r-protein cohort at a gene-specific level (Figure 4A,B). Among mRNAs encoding cytosolic r-proteins the pattern of overtranslation in the rpl24b mutant was generally mirrored and enhanced in the eif3h mutant. In contrast, the pattern in the pab2 pab8 mutant bore no resemblance to that in rpl24b or eif3h. The joint overtranslation in rpl24b and eif3h did not generally extend to the translation initiation factors; among the few that were jointly stimulated, we found a few eIF3 subunits (Figure 4A; cell 6C, eIF3g; 2A, eIF3i; 14A, eIF3k). The mutation in rpl24b also stimulated the mRNA transcript levels of many cytosolic r-protein mRNAs, but the changes at the transcript level were not obviously correlated with those at the translation level. Enhancement of translation of ribosomal protein mRNAs in the rpl24b mutant. (A) Changes in translation state (Δlog2 TL) were plotted onto Arabidopsis biochemical pathways and functional categories using MapMan v3.5.1R2. Each square represents a single gene, and each gene occupies equivalent positions in each set. The log-scale indicates overtranslation (red) or undertranslation (blue) in rpl24b or eif3h or pab2 pab8 compared to wild-type. Ribosome occupancy of ribosomal protein mRNAs is stimulated in rpl24b, which is enhanced in eif3h (middle). The similarity does not extend to histones, which are shown as a representative comparison group. It also does not extend to pab2 pab8. Also note that transcript levels (Δlog2 TC rpl24b/WT ) for cytosolic r-proteins tend to be elevated in the rpl24b mutant. Data are for selected gene classes from all A. thaliana probe sets (genes) on the GeneChip® Arabidopsis ATH1 Genome Array (n = 22,746). (B) Scatterplot showing the translational codependence of cytosolic (black filled circles) and organellar (red and green filled circles) r-protein mRNAs on RPL24B and eIF3h. Genes encoding organellar r-protein mRNAs are further subdivided into nuclear-encoded (nuc) and chloroplast-encoded or mitochondrion-encoded (chl/mit). Pearson correlation coefficients (R2) for cytosolic (C), organellar (O) and all (All) r-protein mRNAs are indicated. Dashed lines (blue and red) represent 1.5-fold changes. The number of mRNAs (n) for each class of r-protein is also indicated. Among the mRNAs for organellar r-proteins, those encoded in the nucleus were translationally stimulated in a similar fashion in the two mutants, although the trend was weaker than for the nuclear-encoded cytosolic proteins (Figure 4B, Additional file 4: Figure S3). In contrast, mRNAs for r-proteins that are encoded in the organelles themselves, that is, the plastid or mitochondrion, all had reduced ribosome loading in the rpl24b and eif3h mutants. The effect on the organellar mRNAs must be indirect because RPL24 and eIF3h function only in the cytosol. It should be noted that our array data are biased for polyadenylated mRNAs. In the organelles, polyadenylation is a precursor for degradation . Thus, our results suggest that, in the wild-type chloroplasts, polyadenylated mRNAs remain substantially ribosome loaded, whereas in the mutants, the ribosome loading of the polyadenylated mRNAs is reduced. Because the r-protein mRNAs were reliably expressed and showed robust cotranslation among themselves and between rpl24b and eif3h mutants, we characterized their translational coregulation in greater detail. Figure 5B shows that the ribosome occupancy (Translation State) of the r-protein mRNAs in wild-type plants varied dramatically among the different mRNAs. Certain extremely short mRNAs should have low ribosome occupancy, simply because few ribosomes fit onto the coding sequence of a small mRNA. This was indeed the case for several of the smallest r-proteins (for example, L41). However, even among the paralogs of one family, it was common for one paralog to be highly translated, and another paralog to be poorly translated (for example, L7, S12). However, the reproducibility of the ribosome occupancy between the two replicate experiments was excellent. Certain r-protein mRNAs have incomplete coding sequences  and have been marked as pseudogenes . These mRNAs tended to have lower ribosome occupancy (Figure 5B), Additional file 5. Translation states of ribosomal protein paralogs. Each ribosomal protein is encoded by up to seven paralogs named A to G. The molecular weight of the protein is indicated on the left. The heatmap in (B) shows absolute ribosome occupancy of the r-protein mRNA in wild-type plants, while the heatmap in (A) shows the increase (yellow) or decrease (blue) in ribosome occupancy in the rpl24b and eif3h mutants (see scale at the bottom). Gray color indicates that the gene does not exist or is not represented on the array. Dots indicate pseudogenes and incomplete open reading frames (ORFs). In (B), the left and right panels show average ribosome occupancy (Translation State) from two replicates of the wild-type control plants grown for the eif3h experiment  and from three replicates of the wild-type of the rpl24b experiment (this study), respectively. Figure 5A shows how ribosome occupancy of the r-protein mRNAs was affected in the rpl24b and eif3h mutants. The following numbers of mRNAs cleared statistical significance at FDR <0.05: 42 mRNAs that changed ribosome loading in eif3h and 16 in rpl24b (Figure 5A and Additional file 4: Figure S3 and Additional files 1 and 5). Several generalizations are supported by these data. First, certain mRNAs with very high ribosome occupancy in the wild-type (Figure 5B) did not increase their TL in the mutant, presumably simply because TL was already close to maximal (for example, L4D and S3aA). Vice versa, mRNAs with medium or low ribosome occupancy in the wild-type had an upward trend in the mutant (for example, L7D, L18aC). Second, for many r-protein families, the degree of translational dependence differed between the different paralogs; clear examples include L3, L12, L13, L18a, L21, L35a, P0, Sa, S2, S12, S15a, S25, and S30. Third, in keeping with the pattern of cotranslation between rpl24b and eif3h described earlier (Figure 3A) the paralog with the strongest stimulation in rpl24b often had the strongest stimulation in eif3h. For examples, see L3, L4, L7, L12, L13, L18a, L21, L22, L26, L29, P0, S6, S18, S21, and S30. Clear exceptions were rare. RPL24 presents one of the few exceptions, almost certainly because the RPL24B mRNA is truncated by a deletion in the rpl24b mutant . Fourth, in a minority of r-protein families all paralogs were slightly reduced in their ribosome loading in the rpl24b mutant. Most of these r-proteins were small proteins of less than 10 to 13 kDa . Examples are L29 (7 kDa), L35a (12.8 kDa), L36a (12.1 kDa), L37a (10 kDa), L39 (6.4 kDa), S21 (9 kDa), S25 (12.1 kDa), S27 (9.5 kDa), S28 (7.4 kDa), and S30 (6.9 kDa). In contrast, most of the larger r-proteins had at least one paralog that was translationally stimulated in the rpl24b mutant. On this topic, we note that the translation of these short mRNAs was generally normal in the eif3h mutant. In the eif3h mutant, long mRNAs are preferentially inhibited in their ribosome loading, but short mRNAs are not . This is one exception from the general rule of correlated translation behavior between the two mutants. Finally, certain r-protein paralogs code for incomplete open reading frames. Of the eight such cases  for which we have data (Figure 5A), none were translationally stimulated in either of the mutants, in sharp contrast to the general pattern. Indeed, the two mRNAs with the strongest translational repression in eif3h, RPS12B and RPS25C, both encode incomplete ORFs and are annotated as pseudogenes in The Arabidopsis Information Resource, release 10. It is unclear why these mRNAs are more sensitive to the mutations. Taken together, considering the detailed annotation features just discussed, it appears that the r-protein regulon probably includes more mRNAs than was evident from Figure 4. While Figure 4 suggested that certain r-protein mRNAs might be excluded from the regulon, detailed inspection of Figure 5 makes this hypothesis harder to sustain. Of the cytosolic r-proteins above 13 kDa, the majority showed translational stimulation in both rpl24b and eif3h for at least one paralog. Paralogs that were stimulated less in the mutants often had a near maximal translation state in the wild-type. These mRNAs should be counted as legitimate members of the r-protein regulon. Other paralogs that bucked the general pattern and should not be considered part of the r-protein regulon code for incomplete r-proteins and RPL24B itself. Given that the rpl24b mutant shared a common set of translationally stimulated and translationally inhibited mRNAs with eif3h, we examined whether these mRNAs harbored the same features that render some Arabidopsis mRNAs eIF3h-dependent. These features are uORFs and a long coding region . As shown in Additional file 6: Figure S4, uORFs only played a weak role in causing poor translation in rpl24b. In detail, a statistically significant association between uORFs and RPL24B-dependent translation was seen only within the middle range of the distribution (> - 0.6 ΔTL <0.8), but not for the more strongly RPL24B-dependent mRNAs (ΔTL < -0.6). The association of ORF length with RPL24B-dependence was also weak (Additional file 6: Figure S4A). In contrast, for the eif3h dataset, our reanalysis of the earlier data  reproduced the conclusion that uORFs correlate with eIF3h dependence (Additional file 6: Figure S4B). To get a clearer view of this unexpected result, we examined the occurrence of uORFs among the undertranslated genes found in clusters 1, 2, and 3 (Figure 2). The mRNAs that were clearly codependent on both RPL24B and eIF3h, were not enriched for uORFs (Additional file 6: Figure S4C), while the mRNAs that were strongly eIF3h-dependent but weakly RPL24B-dependent tended to be the ones with uORFs. Apparently, the rpl24b mutation caused only a minor deficiency in ribosome loading for the uORF-containing mRNAs. This was surprising, because if one measures reporter protein translation downstream from a uORF in the rpl24b mutant, the deficiency in translation can be quite pronounced [25, 26]. In summary, the effects of the mutations in eIF3h and RPL24B on ribosome occupancy are related but not identical. Data on mRNA translation states can be variable between biological replicates. We examined the structure of the variation in translation states that we observed among 12 different RNA samples from wild-type seedlings, collected from seedlings grown on defined agar medium under largely identical experimental conditions. We focused on the 20% of mRNAs with the largest variation in translation state among the replicates, that is, a standard deviation above 0.49 (Figure 6A). Likewise, we identified a group of mRNAs with highly variable mRNA transcript levels (Figure 6B). Variability of translation states in wild-type plants under controlled growth conditions. Translation state (TL) values and transcript levels (TC) were collected from 12 bona fide identical biological replicates of wild-type seedlings grown under standard growth conditions. (A) Line histogram showing the distribution of the standard deviations (SD) of the translation state (TL). The 20% of mRNAs with the highest standard deviation (>0.49) are highlighted in red to the right of the vertical line. The inset shows the distribution of the TL values as a boxplot. (B) Line histogram showing the distribution of standard deviations for total transcript levels. The 20% of mRNAs with the highest standard deviation (>0.375) are highlighted in red to the right of the vertical line. The inset shows the distribution of total transcript levels as a boxplot. (C) GO analysis of mRNAs with highly variable translation state using the DAVID (Database for Annotation, Visualization and Integrated Discovery) functional annotation tool. (D) GO analysis of mRNAs with highly variable transcript levels. 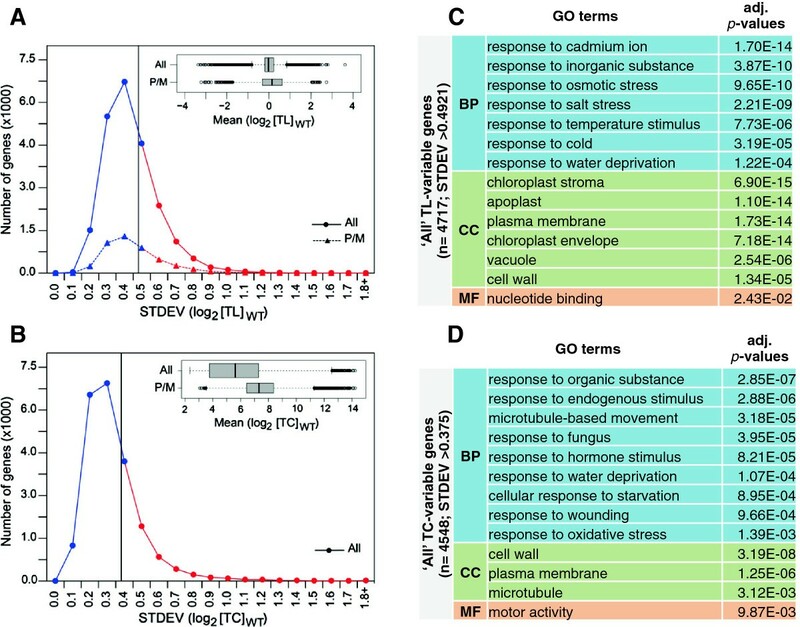 Gene ontology (GO) of the translationally variable mRNAs revealed that the most enriched biological process (BP) was 'response to abiotic stimulus’. Within this category, many different stimuli and stresses were represented and none stood out (Figure 6C). The most enriched cellular compartment was the 'chloroplast’ , and multiple compartments such as 'stroma’ and 'envelope’ , but not 'thylakoid’ , were overrepresented. The overrepresentation of plasma membrane, apoplast, cell wall, and vacuole suggests an abundance of secretory mRNAs. The functional bias of the translationally variable genes towards 'abiotic stimuli’ suggests that the variation in translation state is likely a deliberate response of Arabidopsis to subtle differences in growth conditions. This was the case even though all four experiments were performed by the same person in the same growth chamber under nearly identical conditions. Given the diversity of stimuli listed, several different environmental factors may be involved. This result is also in keeping with the notion that many mRNAs that are functionally associated with environmental plasticity are regulated at the translational level [6–11, 13, 15, 16]. We suggest that noticeable effects on translation state can occur in response to very subtle (that is, unintentional) differences in growth conditions. This study describes the first global analysis of defects in ribosome loading in a plant ribosomal protein mutant and one of few such studies in eukaryotes . The cytosolic RPL24, a subunit of the large (60S) subunit of the ribosome, is located near the 40S to 60S subunit interface on the lower hemisphere of the 60S, below the elongation factor binding site. During translation elongation, the protein faces forward, toward the 3′ end of the mRNA [44, 45]. A mutation in mouse RPL24 (Bst) causes a pleiotropic developmental phenotype. The hypomorphic mouse mutant allele impairs RPL24 mRNA splicing and synthesis of the RPL24 protein. While the homozygous allele is lethal, heterozygotes have a reduced protein synthesis rate and altered rRNA ribosome biogenesis , while polysome profiles appear quite normal. In contrast, a double mutant in the two RPL24 genes of Saccharomyces cerevisiae is viable. The yeast mutations reduce the growth rate in vivo and the protein synthesis rate in vitro, probably because of reduced P-site tRNA binding. The rpl24 mutant yeast polysome profile shows stalled initiation complexes [4, 30]. RPL24 being one of the last proteins to be assembled into the 60S , it is thought that other ribosomal proteins can join together successfully without RPL24. One might consider that a mutation such as rpl24b affecting the large ribosomal subunit may cause a translation elongation defect. Such a defect might slow the movement of ribosomes and therefore raise ribosome numbers per mRNA, and thus raise polysome loading, which would appear as an increase in translation state. Such a defect in the translation elongation cycle would be compounded in an exponential way by the length of the protein coding sequence. We did not observe a consistent global increase in ribosome loading when we monitored the RNA absorbance profile of our rpl24b mutant polysome gradients. Of note, we also did not detect evidence for half-mers, polysomes with a 40S subunit stalled on the start codon, as were observed in the yeast rpl24 mutant . Third, the observed increase in ribosome loading in rpl24b was gene specific, and preferentially affected the r-protein mRNAs, which are rather short, rather than long mRNAs. Many ribosomal proteins play fundamental roles in ribosome assembly . However, we are not inclined to conclude that the rpl24b phenotype reflects a direct ribosome biogenesis defect, for the main reason that the fundamental aspects of the rpl24b mutant phenotype are mirrored by eif3h, a mutation in an initiation factor, which would not affect ribosome assembly directly. Taken together, we did not see clear hallmarks of defects in translation elongation or ribosome assembly in rpl24b, although we do not categorically rule out that they might exist. The rpl24b mutant stimulated the expression or the ribosome loading of certain r-protein transcripts (Figures 4 and 5). Between the transcriptional and translational upregulation, a large proportion of r-proteins received some boost in expression in the rpl24b mutant. A similar result was seen in eif3h. It is conceivable that the mutant plants sense the defect in the translation apparatus, for example defective ribosomes lacking RPL24. The molecular phenotype that we observe suggests the existence of a 'translation machinery surveillance’ response, which then stimulates expression of ribosomal proteins. It is currently not possible to tease apart which components of the rpl24b mutant phenotype are due directly to the loss of the RPL24B protein and which are due to the indirect effects of the mutation on other r-proteins. The problem of indirect effects is perhaps even more acute in vertebrates because ribosomal mutations trigger a p53-dependent nucleolar stress response pathway . Whether ribosomal mutations in plants trigger an analogous response is currently unknown. Based on transient gene expression assays, Arabidopsis RPL24 functions during translation reinitiation on the 35S RNA of cauliflower mosaic virus (CaMV) . Moreover, the rpl24b mutant was originally identified as shortvalve1 by virtue of its short valves, which are the walls of the seed pod . The RPL24 protein boosts the translation reinitiation of two uORF-containing auxin response transcription factor (ARF) mRNAs, ETTIN (ETT) and MONOPTEROS (MP) , in conjunction with eIF3h . Based on this information, we hypothesized that eIF3h and RPL24 may be involved in similar (re)initiation events or may coregulate the expression of uORF-containing or other mRNAs. The data obtained from the global analysis of ribosome loading only partly confirm this hypothesis. Indeed, several dozen mRNAs depended on both eIF3h and RPL24B for regular ribosome loading (Figure 2A). Surprisingly, however, these mRNAs were not highly enriched in uORFs. Vice versa, mRNAs with uORFs that have clearly reduced ribosome loading in eif3h, tend to have a rather mild translation defect in rpl24b (Additional files 1 and 6). This result shows a certain discrepancy between translation as measured using gene expression assays and translation as measured using ribosome occupancy. The result is actually reminiscent of earlier observations. For example, the AtbZIP11 mRNA, which is clearly eIF3h dependent and RPL24B dependent in the gene expression assay [20, 21, 24, 25], has a relatively modest and statistically insignificant ribosome occupancy defect when measured by microarray . One probable cause is this; when the ribosome loading is reduced by twofold from six to three ribosomes per mRNA, most mRNA molecules will still be in a 'polysomal’ state. One might further consider that the respective uORF-containing mRNAs remain ribosome loaded in the rpl24b mutants because ribosomes persist on their uORF clusters. We can also speculate that mutant rpl24b ribosomes might reinitiate translation imperfectly; they may translate portions of the major ORF in an unproductive way that does not lead to a full protein. For comparison, other mutations in the translation apparatus affect the fidelity of start codon recognition [46, 47]; aberrant initiation at non-AUG start codons or non-canonical reading frames could potentially be detected using the ribosome footprinting technique . As we compare translation between rpl24b and eif3h, we should comment on the fact that the two experiments were performed under different light regimes. The rpl24b experiment was performed under a 16 h light/8 h dark cycle and the plants were harvested approximately 4 h into the light period, while the other experiments were carried out in continuous light. We do not think that the intermittent dark treatments contributed in a major way to the differences in translation. By examining the mRNA levels of characteristic clock gene transcripts we determined that the continuous-light-grown plants and the rpl24b plants were entrained in a similar way by the circadian clock. In addition, when dark-treated plants are reilluminated, the ribosome loading for the majority of mRNAs recovers within 10 minutes . 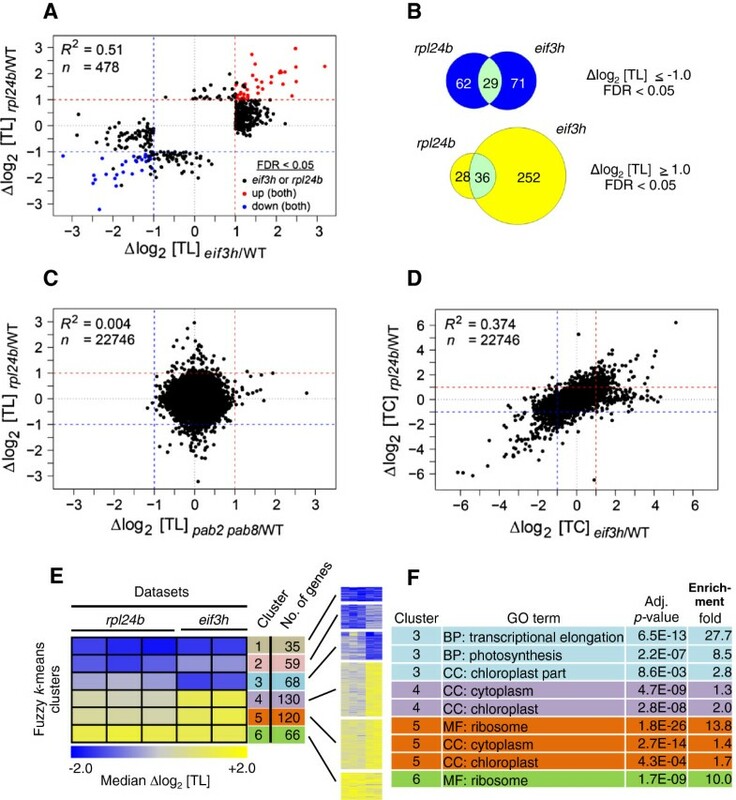 Even when fully etiolated seedlings are exposed to light, the major adjustment in polysome loading occurs within 4 h .
This work suggests the presence of several translational regulons, defined as groups of mRNAs that are subject to joint translational control across a variety of conditions. We newly noticed that a subset of seed storage protein mRNAs are jointly stimulated in their translation in the pab2 pab8 mutant. Since this group has not shown coregulation under other conditions, it does not qualify as a regulon as yet. However, r-protein mRNAs clearly form a regulon. Among the r-proteins, the organellar encoded ones are clearly set apart from the nuclear encoded ones. Given their correlated behavior in rpl24b and eif3h, the organellar r-protein mRNAs appear to be part of a distinct regulon of mRNAs. The r-protein regulon holds steady under other experimental conditions, given that r-protein mRNAs are among the most sensitive to hypoxia and other stresses [6, 7]. It is possible that certain r-proteins are excluded from the regulon. However, aside from the 'incomplete’ r-protein mRNAs, it is difficult to identify specific examples. While certain r-proteins seemed to be stimulated less than others by the rpl24b and eif3h mutations, this could often be attributed to the fact that their translation state was already very high in the wild-type (Figure 5A,B). Thus, it seems plausible that a large fraction of nuclear encoded r-protein mRNAs are subject to coordinated translational regulation. Interestingly, while the response of the r-proteins to mutation is fairly uniform across the entire group, individual r-protein mRNAs vary greatly in their ribosome occupancy (Figure 5B). 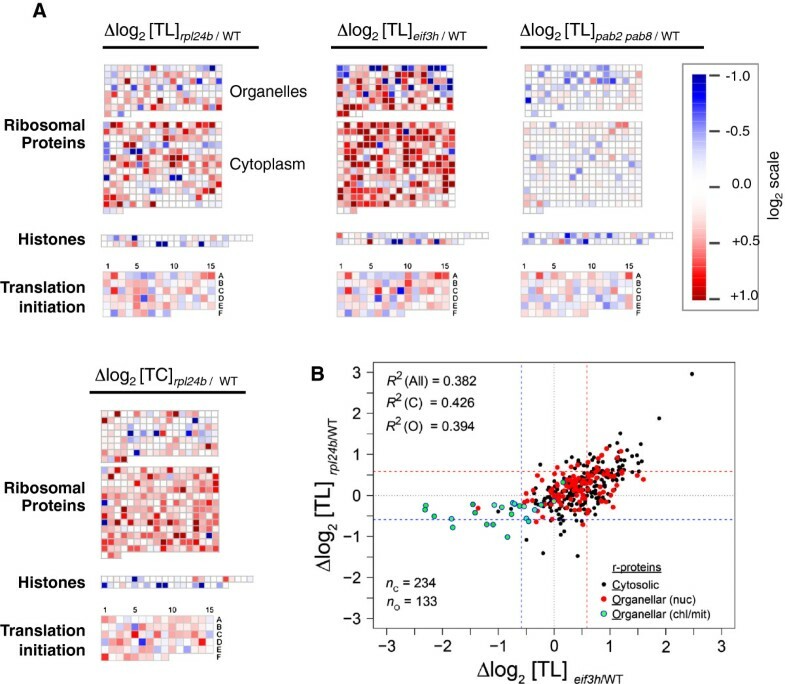 This result has implications for ascribing functions to individual r-protein paralogs in the context of the hypothesis that the cell contains different ribosomes with specialized functions. When two mutations in sister paralogs display different phenotypes, even though the patterns of transcript abundance of their mRNAs are identical, such differences in phenotype may be due to different rates of translation. Although the r-protein regulon is functionally the best-characterized plant translational regulon, questions regarding the RNA sequence features responsible for its regulation remain to be addressed in future work. In general, it is unknown what causes the differences in ribosome occupancy among the paralogs. Given that their r-protein coding sequences are highly similar, one must consider whether ribosome occupancy is governed by sequences in the more variable 5′ and 3′ UTRs. A mutation affecting a large ribosomal subunit protein, RPL24B, stimulates ribosome loading in a similar way as a mutation in the eukaryotic initiation factor subunit, eIF3h, whereas a mutation in poly(A)-binding protein has a distinct, milder, spectrum of effects. The most striking translational effects are centered on the ribosomal protein mRNAs, suggesting that a large subset of these mRNAs forms a regulon of translational control. A. thaliana ecotypes for wild-type plants and alleles and ecotypes for mutants were described previously [21, 25, 26, 34]. Wild-type plants, and the pab2 pab8 double mutant (alleles SALK_026293 of PAB2 (At4g34110) and SALK_022160 of PAB8 (At1g49760)) are in the Columbia-0 (Col-0) ecotype . The eif3h-1 mutant allele (At1g10840)  and rpl24b (stv1-1) mutant allele (At3g53020)  are in the Wassilewskija (Ws) ecotype. The rpl24b mutant has a deletion covering several genes neighboring RPL24B, and also carries a transgene expressing the small myb protein, CAPRICE at the RPL24B locus . Compared to the deletion of RPL24B, these additional mutations are likely to have at most small effects, if any, on translation. The pab2 pab8 mutant is slightly dwarfed in its growth . The mRNA signals were reduced more than 30-fold for PAB2 and 10-fold for PAB8 (Additional file 1), consistent with loss of function. The mutation in eif3h-1 causes a C-terminal truncation of the protein . A T-DNA insertion for eIF3k (At4g33250) was recovered from the GABI-KAT collection . The mutant has an insertion in the sixth and last intron and produces a 3′ truncated transcript, but no full length transcript was detected (data not shown). The eif3k mutant seedlings lacked any obvious phenotype at the seedling and adult stages. The rpl24b mutant allele stv1-1 were grown on agar plates containing full strength Murashige and Skoog salts, pH 5.7, and 1% sucrose for 10 to 12 days in a 16 h light/8 h dark cycle at 22°C alongside the corresponding wild-type plants. They were harvested 6 h into the light period. The pab2 pab8 mutant, the eif3k mutant and the eif3h-1 mutant were grown in continuous light. There were three biological replicates for rpl24b and four for pab2 pab8. The translation efficiency is given by the number of protein molecules synthesized per mRNA molecule per unit time . If one assumes that the rate of elongation, estimated at 5.6 codons/s , is approximately uniform across all mRNAs, then a measure of the translational efficiency of an mRNA can be estimated from the ribosome density, defined as the number of ribosomes per length of mRNA, or the ribosome occupancy, defined as the proportion of mRNA molecules found in the polyribosomes. The entire procedure closely followed that given in . Aerial tissues were homogenized and subjected to sucrose-gradient fractionation to generate two fractions of mRNAs: the non-polysomal fraction (free and monosomal, NP) and the polysomal fraction (PL) (Additional file 7: Figure S5). Samples for total transcripts (TC) were also collected alongside. Following manufacturer’s protocols, PL, NP and T RNA fractions were converted to cDNA and hybridized to GeneChip® Arabidopsis ATH1 Genome Arrays, Affymetrix, Santa Clara, CA which contain more than 22,500 probe sets representing approximately 24,000 genes. If a given experimental treatment causes a global reduction in polysome loading, the global shift becomes masked during the standardized experimental procedure. The global shift is measured using polysome UV-absorbance profiles and RNA abundance measurements . In our hands, neither the rpl24b mutant nor the pab2 pab8 mutant showed any reproducible global shift in polysome loading (not shown). Therefore, no global adjustment was performed. Because we cannot rule out that small global shifts in polysome loading did occur in the mutants, our data only speak to gene-specific changes. Raw signal intensities for each probe set were extracted from CEL files (Affymetrix proprietary data format) using the open source statistical tool R/Bioconductor , and the affy package . We compared three background correction and normalization methods, MAS5, Robust Multi-array Average, and gcRMA. We settled on the Robust Multi-array Average algorithm because it minimized the variance in TL among the biological replicates (Additional file 8: Figure S6A,B) and was more successful in identifying differentially translated genes as judged from volcano plots (Additional file 8: Figure S6C-F). Therefore, the two replicates of raw data on eif3h-1 were re-extracted using RMA. Translation states (TL) were calculated as the ratio between PL and NP as TL = (PL)/(NP) for mutant and wild-type samples and were displayed after log2 transformation. The ratio in TL between the respective mutant and wild-type is given as a log-difference by Δlog2 TL = log2 (TLmut/TLWT) = log2 TLmut - log2 TLWT. Differences in the total transcript level (TC) are also given as log2 ratios, as usual. The complete set of genes (n = 22,746) represented on the GeneChip® Arabidopsis ATH1 Genome Array microarray ('All’) was prefiltered based on one of two simple gene expression criteria. First, Present (P), Marginal (M), or Absent (A) calls were recorded using the mas5calls function of the Bioconductor MAS5 algorithm. For the 'P/M’ set, only those genes were included that had 'P’ and/or 'M’ calls in at least 50% of the arrays of each dataset (n = 8 to 16). Second, for the 'Stable’ set, we selected only genes that had a low variance in their translation state across a panel of 12 wild-type samples (see below). Prefiltering yielded four gene sets, that is, 'All’ , 'P/M’ , 'Stable’ and 'Stable and P/M’. While some differentially translated genes may be lost during prefiltering, the reduced size of the prefiltered data sets increases the statistical power. Genes that are differentially translated (DTGs) between mutant and wild-type plants were identified in two ways. First, we took all four prefiltered sets defined above and applied limma with a cut-off against false-positive discovery of 0.05 (FDRBH 5%) to adjust aggressively for errors due to multiple-hypothesis testing [53, 54] and at least a twofold difference in TL. Any gene identified by any one of the four prefilters and passing limma/FDR was considered a DTG. An alternate method ('ad hoc’ filtering, ) simply examines the replicates for their fold change between mutant and wild-type, as well as the coefficient of variation (CV) thereof. With the ad hoc filter, genes were selected based on any one of three criteria; (i) a fold change of more than twofold (log2 ≥1.0) in all replicates; (ii) any fold change (as log2) with a coefficient of variation of less than 50%; (iii) any fold change (as log2) with a SD of less than 0.5. The ad hoc method captures most genes identified by limma/FDR, but also preserves reproducibly unchanged genes as well as genes whose up or down trend is clear but too noisy to withstand more rigorous FDR filtering (Additional file 9: Figure S7). To define genes with differential transcript levels (Δlog2 TC) only the limma/FDR method was used. Higher level analyses of DTGs utilized fuzzy k-means clustering as described previously [8, 55, 56]. Briefly, to identify coregulated genes, clusters of mRNAs were resolved by fuzzy k-means clustering with the fanny function of the R cluster package  using the following settings: distance measure = Euclidean correlation, membership exponent = 1.1, maximal number of iterations = 5,000, and number of clusters determined by trial and error. Clusters of genes and values of fold changes (Δlog2 TL) of mRNAs were visualized as heatmaps with the graphical interface programs MEV  and Genesis . Groups of genes identified by clustering or other means were evaluated for enrichment of functional annotations using the Genome Ontology tools GOHyperGAll function  and the DAVID (Database for Annotation, Visualization and Integrated Discovery) database . Moreover, fold-change values of translation states (Δlog2 TL) of the whole genome (n = 22,746) were plotted onto Arabidopsis biochemical pathways and analyzed for functional bias of gene expression using MapMan v3.5.1R2 . 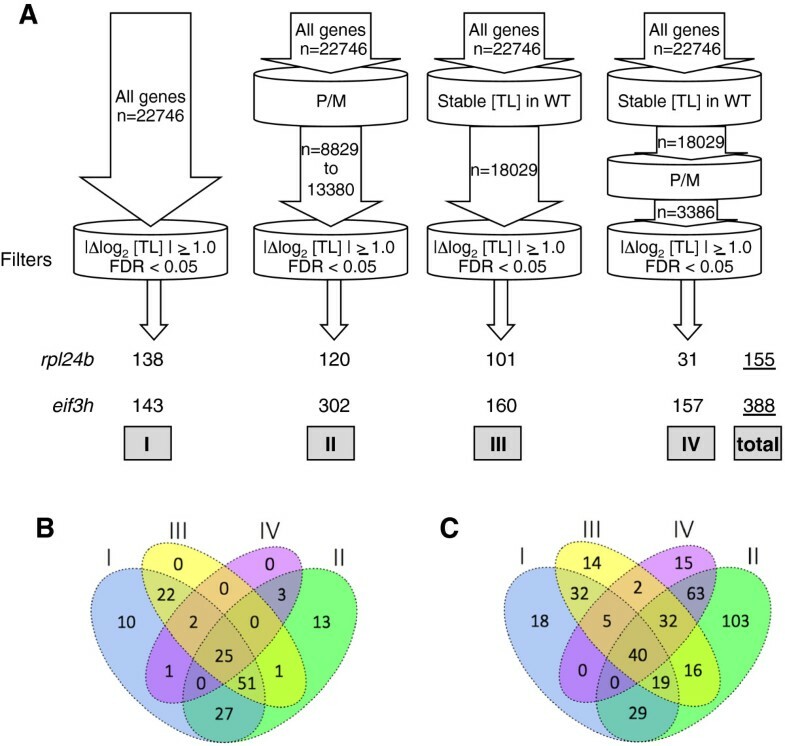 Ribosomal protein annotations were identified from [42, 43]. Translation states (TL) of mRNAs from wild-type seedlings were tabulated for 12 biological replicates from 4 separate experiments. These samples were the wild-type control samples from experiments performed with eif3h-1 (2 replicates), rpl24b (3 replicates), pab2 pab8 (4 replicates) and eif3k (3 replicates). Data from 'All’ probesets were retained without any prefiltering. The standard deviations were calculated across all 12 datasets. The top 20% of genes with the highest standard deviations were classified as genes with highly variable translation state; while the remainder was classified as 'Stable’. Among the latter, genes devoid of any 'MAS5 Absent’ calls were classified as 'Stable and P/M’. New array data were submitted to the Gene Expression Omnibus database  under the following accession numbers: pab2 pab8: GEO - GSE51480; rpl24b: GEO - GSE51474; eif3k: GEO - GSE28224. Previously published data are found here: eif3h mutant : GEO - GSE6024 (TL) and GEO - GSE6025 (TC). Dr Julia Gouffon at the UT Affycore facility performed all cDNA syntheses and microarray hybridizations. R codes for fuzzy k-means and GOHyperGAll functions were kindly provided by Dr Julia Bailey-Serres and Dr Piyada Juntawong, University of California Riverside. We thank Qidong Jia for help with 5′ untranslated region (UTR) sequence analysis. The experimental analysis of the rpl24b mutant was funded by DOE Energy Biosciences grant DE-FG02-96ER20223 to AGvA. The bioinformatic analysis and the experiments with the pab mutant were funded by NSF grant DBI-0820047 to AGvA and DRG. BST performed bioinformatic and statistical analyses. BHK performed experimental work and contributed bioinformatic analyses. DRG and BR contributed reagents and advice. AGvA and DRG conceived of the study. AGvA guided all aspects of the project. BST and AGvA wrote the article. All authors read and approved the final manuscript.